German 16th century printmakers: Heinrich Aldegrever, Jost Amman, Hans Sebald Beham, Hans Brosamer, Hans Burgkmair, Lucas Cranach, Albrecht Durer, Albrecht Durer (After), Hans Holbein (After), Hopfer Brothers, Georg Pencz, Hans Schäufelein, Virgil Solis, Wolfgang Stuber. 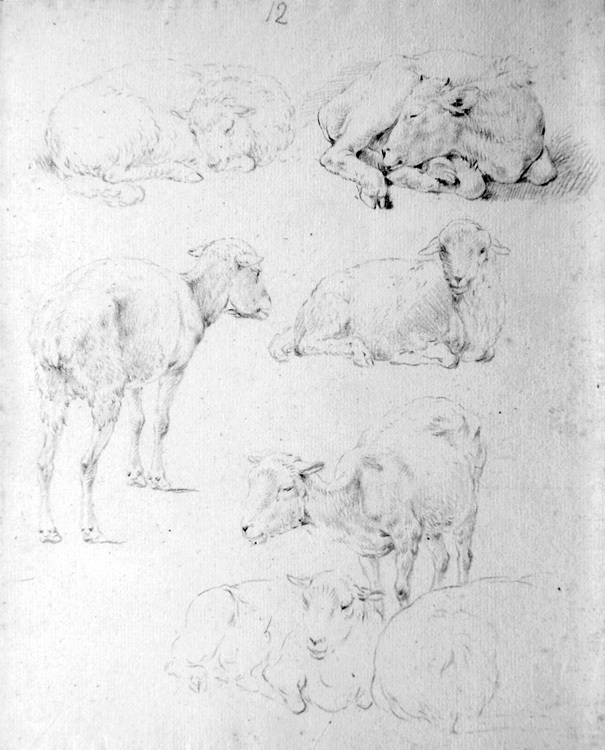 According to an article in the Dictionary of Art by Hermann Jedding, Roos "was the most important German animal painter of the 17th century; his realistic views of cattle, goats and sheep in the gentle sunshine of southern landscapes were much copied in Germany and Holland until the early 19th century. His family left their home in the Palatinate c. 1637, fleeing the Thirty Years War, and moved to Amsterdam c. 1640. There, Roos trained (1647-51) in history painting with Guilliam Dujardin (1597-after 1647), in landscape with Cornelis de Bie and in portraiture with Barent Graat. 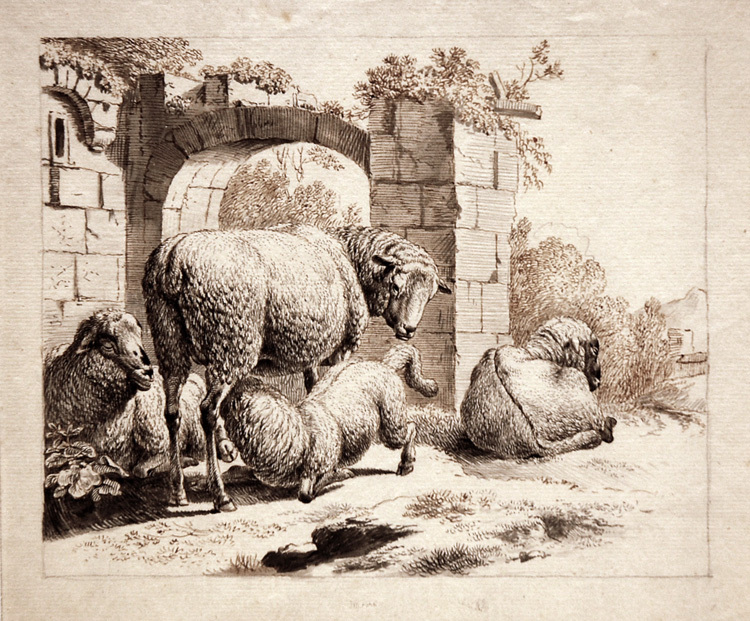 However, the younger Italian-inspired landscape painters Nicolaes Berchem and Karel Dujardin were to prove more influential on Roos's development of the pastoral idyll. He left Amsterdam in 1651-2; in 1653 he was working in Mainz, and from 1654 to 1659 he was employed at the court of Landgrave Ernest of Hesse in Rheinfels, where he painted a portrait of A Prince (1654, Heidelberg, Mus. Staat), religious scenes (1655; destr.) for the castle chapel and the first pastoral idylls. After 1659 Roos painted further portraits in the Palatinate and Mainz, before becoming court painter in 1664 to Charles Ludwig, Elector of the Palatinate, in Heidelberg. Because of unsatisfactory working conditions there he moved to Frankfurt am Main in 1667, where he soon established himself. He died from injuries sustained when his house caught fire. "Roos painted mainly what are known as pastoral idylls, pictures of herdsmen and livestock in idealized southern landscapes scattered with ancient ruins: over 200 are known, dating from 1657-8 to the year of his death. The beasts' bodies acquire a three-dimensional reality in the glittering sunshine, occupying the foreground in a variety of patterns. . . . These pastoral idylls demonstrate the longing for a harmonious bond linking men and animals with nature, after the devastation of the Thirty Years War. . . . Roos worked from numerous individual drawings (main collection, Vienna, Albertina), especially of domestic animals. In these he intensified the individuality of each species to the utmost. The drawings start to have an independent status only from c. 1661. For preference Roos drew with red chalk. His 39 etchings depict animals; four series date from 1663-4, 1665, c. 1668, and 1671. His paintings are held in many museums in Germanu and elsewhere in Europe [and, increasingly, the U.S.]" (27: 134-35). Select Bibliography: Hermann Jedding, Erich Hubala, Hans Steinebrei, Wolfgang Stolte, Der Tiermaler Johann Heinrich Roos 1631-1685 - Gemälde, Zeichnungen, Druckgraphik. Zum 300. Todestag (Kaiserslautern: Pfalzgalerie Kaiserslautern, 1985); Hermann Jedding, Johann Heinrich Roos. Werke einer Pfälzer Tiermalerfamilie in den Galerien Europas (Mainz: Philipp Von Zabern Verlag, 1998). Sheep near a ruin. Pen and and brush, black and brown ink and wash on cream laid paper with paart of a crown watermark. 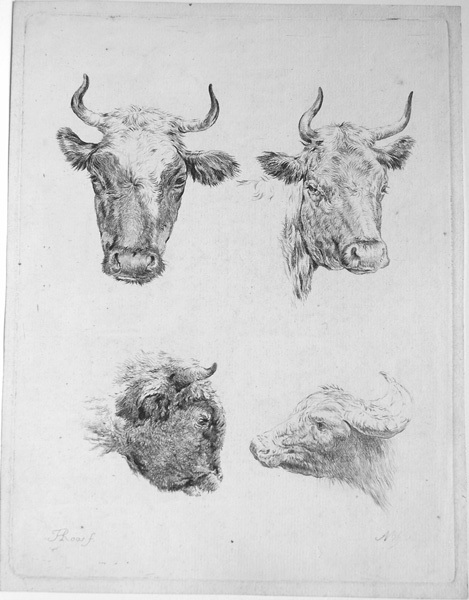 This appears to be a study for the etching of the same title (B. 11), which varies only in a few minor details. Image size: 143x176mm. Price: $3000. Studes of shorn sheep and a calf. Black chalk on laid paper with a fragment of a watermark (possibly a fleur-de-lys?). These are the kinds of studies that seem to have been preparatory to etchings like Shorn Sheep with a Ram (B. 36). Annotated "12" top center. Image size: 234x191. Price: $1500. Studes of shorn sheep resting. Black chalk on laid paper with a fragment of a watermark (possibly a fleur-de-lys?). 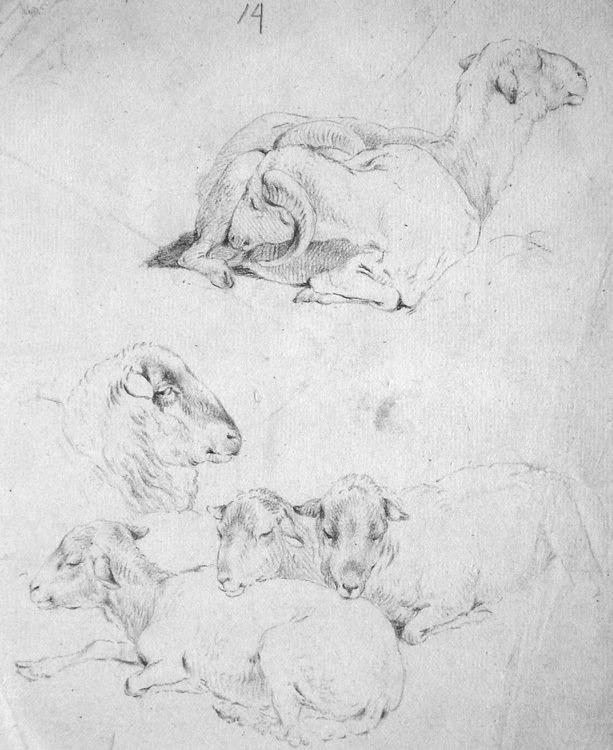 These are the kinds of studies that seem to have been preparatory to etchings like Shorn Sheep with a Ram (B. 36). Annotated "14" top center. Image size: 202x163. Price: $1500. Study of a sleeping bull. Black chalk on laid paper. 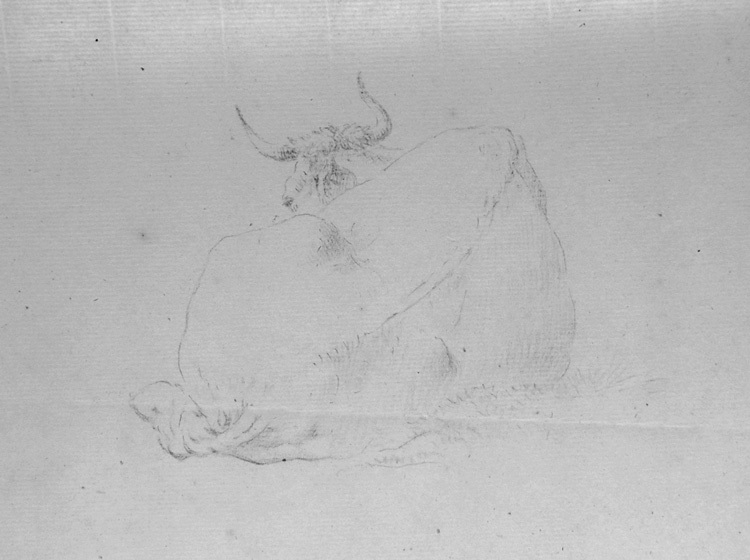 This appears to be a study for the sleeping bull in the etching Cow and Bull (B. 39)., which varies only in a few minor details. Image size: 110x95mm. Price: $1000. Cows, calf, ram. Etching on heavy laid paper. Signed PRoos f. lower left. Possibly by Johann Heinrich Roos's son Philip Peter Roos (Germany 1657-Rome 1706) after a sheet of his father's drawings. Image size: 272x212. Price: $400.